Condominium Association Q&A: Are Grills allowed on a Balcony? QUESTION: This past 4th of July, a lot of the units in our beachfront condominium association enjoyed the day by firing up a grill of some kind on their unit balcony. Does the Fire Code allow this? The National Fire Protection Association (NFPA) Life Safety Code and the Florida Fire Prevention Code (FFPC) are the laws that would govern use of the grills. The FFPC specifically provides that gas-fired, charcoal, and electric grills and hibachis cannot be used on any balcony, under any overhanging portion of the building, or within ten feet of any multi-family residential structure. NOTE: The Codes do not apply to one and two-family dwellings. The latest version of the FFPC, The Fifth Edition, effective on December 31, 2014, now not only prohibits the use of all types of grills on any balcony, under any overhanging portion, or within ten feet of any structure (other than one- and two- family dwellings), but also provides that no hibachi, grill, or other similar devices used for cooking can even be stored on a balcony. The only exception to this rule is that listed equipment permanently installed in accordance with its listing, applicable codes, and manufacturer’s instructions may be permitted under the rule. Your property is subject to periodic inspections by the Fire Marshall’s Office for the particular jurisdiction, and we are hearing reports that the restrictions against using and storing all types of grills on balconies, etc., are now being strictly enforced. I understand the rule, but in the case of our condo, I don’t really see much danger. The floor is concrete, the walls are concrete, and the balcony above is concrete. There might be some smoke or “steak smell” to bother the neighbors, but no fire danger. Our condo does provide a “community” gas grill out near the clubhouse which we have used a few times. We never considered having one on our own balcony. Very informative article. This is one of those laws that is often broken. You would think it’s just common sense not to barbeque on a high rise balcony. I’m going to post the article for the residents of the building in case someone doesn’t have common sense. Please explain the exception, “listed equipment permanently installed in accordance with its listing, applicable codes, and manufacturer’s instructions may be permitted under the rule”. Where can we find the listed equipment info? That information would have to be obtained from the Fire Marshall’s Office. 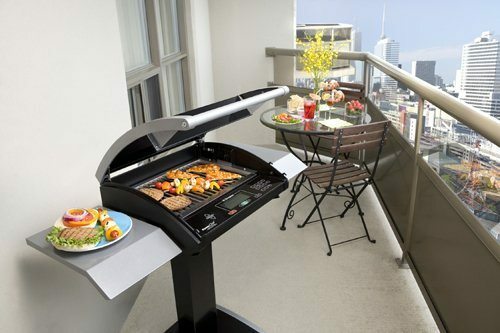 Does the law allow BBQ Grills on a first floor condo screened in patio? As mentioned in the article, the answer to your question is no. You cannot have a grill under any overhanging portion of a building, on any balcony, or within ten feet of the structure. Let us know if you have any other questions. The rules & regulations for our HOA & two story condos have been: Propane grills may be stored on the screened porch of the one story villas. To be used, they must be moved out into the grassy area at least 30 feet from the Bldg. before being ignited. The same goes for only the first floor of the two story condo. Absolutely no grilled allowed on the second floor porch. Does this meet the code entirely or only part for the villas? Next PostWhat Happens When Someone Attempts to Avoid Being Served?